The Bible Hill Kinsmen invite you to a fun-filled evening on Saturday March 1st, 2014 at 7:30pm at the Best Western Glengarry in Truro. 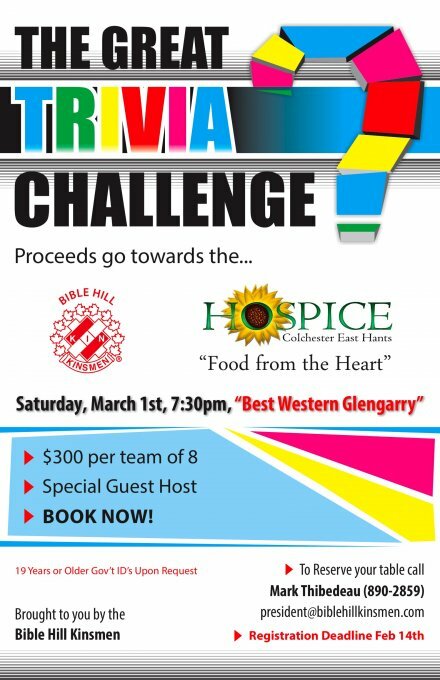 The Bible Hill Kinsmen along with a special guest will host “The Great Trivia Challenge”. This is an event where teams of 8 people – co-workers, friends, or family – will come together to play rounds of trivia. We are anticipating having 30 teams competing against each other and testing their knowledge in sports, music, entertainment, history, and more! There will be lots of food, music, a cash bar, and a silent auction that will take place throughout the night. “The Great Trivia Challenge” will be one of our largest fund-raisers of the year. Proceeds of this event will go towards the Colchester East Hants Hospice Food From The Heart program. Please see the attached poster details of the event. The registration fee is $300.00. Get your team registered early, support a great cause, and enjoy “The Great Trivia Challenge!